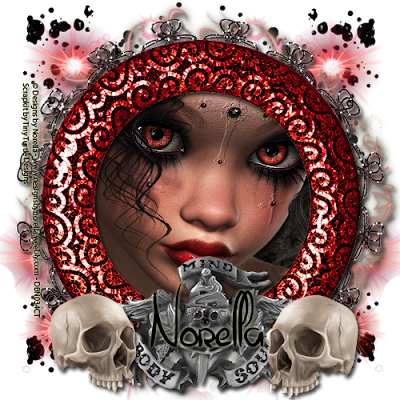 I designed this tag using Designs by Norella's tube "Rosemary". I also used "Darkest Night" scrapkit by Tiny Turtle Designs. Open new 500x500 transparent page. Place element 86 behind bottom left corner of element 23. Place element 43 behind element 86 just placed. Place another element 86 behind bottom right corner of element 23. Place another element 43 behind element 86 just placed. Place another element 86 behind top right corner of element 23. Place another element 86 behind top left corner of element 23.